Join the discussion on our forums! Come discuss Skeram Cultist over in our dedicated Skeram Cultist discussion topic. Just before he comes into play, there is an AWESOME training montage with C'Thun. This feels a little lackluster, like it should at least buff C'thun more. At very least it could give C'thun +3/+3 perhaps. Haha, apparently Ben Brode voiced this card's death sound. Good soft counter to Dark Arakkoa. Have many BGHable targets and need one more to bait out BGH to protect your fatter minions? Then you use Skeram Cultist. Don't have many or no BGHable targets? Then you use Boulderfist Ogre. The one point of note is the ogre will survive things like a fireball. That is a good thing to note. Keep in mind that this card was made for a deck that plays lots of big, BGH-able minions already, several better than this card. Furthermore, if it lives, it's a better Boulderfist that can win games on its own. Also, the 6-mana cost makes it a perfect on-curve play to bait BGH, since BGH turn 6 is super awkward in many cases. If cards like this keep coming out C'Thun decks are doomed to being bad so far you only play MEH cards to buff your turn 10 play (if you draw it) and maybe a good class card that benefits from C'thun having +10 attack but it's really not enough to justify playing inferior minions just for that. So far I see C'thun deck as a deck that new players might play and don't feel bad about just needing to go aggro(not saying aggro is a bad way to start playing but at least you give players an option) cause of lack of better options it's will be an ok.. deck for starters but not competitive.. that's if the rest of the cultists are on this power level. This card does nothing for the board aggro decks will just ignore it or just kill it..
if there's a cultist Mechwarper esque card. well that's another story..
Or just dont use this card in your C'Thun deck and fill it in with another good 6 drop as youve already got Beckoner of Evil and Twilight Elder. 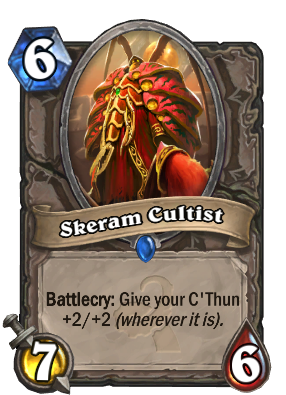 I stated the C'thun archtype would be terrible if the rest of the C'thun cards are like they are (neutral ones, just buff and vanilla stats, and every class gets a "when your C'thun has 10 attack, do something above average" this is clearly not enough to make C'thun decks work if the rest of the cards are a 5/6 with +2/+2 7/8 with +2/+2 etc. Then there's little chance of C'thun decks being competitive. All of a sudden I'm thinking Big Game Hunter shouldn't be nerfed. 0/10 - dies to bgh. Not discussable because of what we don't know about BGH. That's a good point, but the reason we can't run too many high curve threats and Big Game Hunter targets in decks is because they're high costed. You have to get to that point and still be controlling the game. C'thun decks are going to need to outlast the game to be able to play a 10 mana card. Six mana 7/6 doesn't really help with that. That's just my opinion though. At this point, who knows what the meta could evolve into. BGH's value isn't from hard removal. It's from tempo. Playing this on turn 6 and having it BGH would very easily cause an irrecoverable tempo swing. In HS, tempo is everything. That's true. Tempo is very very important. If you're behind you're almost guaranteed lost. Really great cards though, give you a tiny step ahead even if you're behind. Turn 6 Sylvanas (on the right board of course) is awesome for that reason. Given the card is a rare, we can just wait and see. C'thun can easily swing the tempo back into the player's favor. We're talking like 14 damage to the board and then a 14/14 minion they still have to deal with.